Poke, pronounced POH-keh, is a popular trend that has made its way to Oklahoma. One California chef referred to poke as the “next generation of sushi.” It’s a Hawaiian dish of marinated fish, typically tuna, with rice and vegetables. You’ll find it everywhere in Hawaii, from food trucks to high-end restaurants. You may have to look a little harder in Oklahoma to find a great poke bowl, but we're here to help you out. Here are the best places to delicious poke in the state. You’ll find some signature bowls at Nooki that take Oklahoma flavors and combine them with the sushi basics. The Cowboy's Favorite includes beef bulgogi, sushi rice, spring mix, corn, edamame, avocado, crab salad, and more. 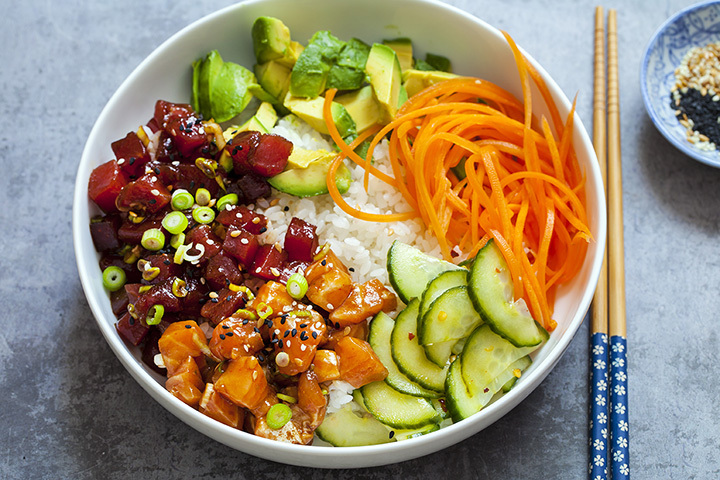 You can also build your own poke bowl. You’ll find poke bowls with your favorite ingredients, or you can change it up by getting those flavors in a “bake” or as nachos. You can build your own or choose from one of their signature bowls. Make your own poke bowl at this place not far from UCO. Pick from five different fish options including shrimp, scallops, spicy tuna, regular tuna, and salmon. Then top things off with options like onion, edamame, ginger, and wasabi. Combining sushi and burritos seems pretty popular in Oklahoma. Bolicious offers a large variety of meats, including shrimp tempura, eel, snow crab, and squid salad. Poke with a Caribbean influence. You can pick the fixings that go into your bowl, and some of the additions include plantains, mango and strawberries. A vegan option includes tempera sweet potatoes. The original ITR is in the Brookside district, which is a great date neighborhood with art galleries and shopping for after dinner. The poke is made traditionally, with tuna and a sauce, served as an appetizer. At Okie Pokie, you can create a poke bowl with the foods you like. Choose rice or salad as the base, then a meat. If you’re not ready to try raw tuna, go with the classic Hawaiian seared Spam. Top it with vegetables, like avocado, mango salsa, scallions and wakame and marinades. Don’t forget a crunchy topping. Fried garlic is recommended. You’ll find some great poke bowls at this shop in north Oklahoma City, including Keto and vegetarian options. There’s even a bowl with crispy chicken strips that might remind you of more classic Oklahoma flavors. Although this restaurant in Automobile Alley only has one poke bowl on the menu, it does have a nice Oklahoma take on poke by including pico de gallo with the traditional flavors. This restaurant features traditional flavors of Thailand but includes some poke bowls on the menu. You’ll find sushi grade tuna and salmon bowls made with raw meat, or you can get teriyaki salmon that is baked or pan-seared shrimp.